Does that mean that if a meteor of the size of a jet were to pass, then this setup would be able to detect that as well?? Yes, but a few square miles inhabited by Russians seems to log it better. Perhaps an NVIS antenna could filter out a lot of the interference? Bookmark those links above for the next Meteor Shower event, during which you’ll see some interesting stuff. It would be interesting to use a second dongle on 1090 MHz to receive the ADS-B signals and try to correlate the reported plane positions with the doppler signals detected. This might not help with the meteor detection, but could automatically remove the plane detections if you come up with a system that sees both. I’ve wanted to do this to figure out where the occasional HDTV dropouts I always get during football games are coming from – I suspect multipath interference from passing aircraft, but have never checked out the local traffic when it happens to find a smoking gun. I was under the impression that DTV is immune to multipath interference. Perhaps this is nothing more than the shortcomings of the system. It’s a bit wonky. Faithful analog reception changed to junk in some instances. I think in the US they use ATSC for digital TV. This is still somewhat susceptible to multipath whereas DVB-T used elsewhere is less susceptible due to OFDM being used. Not exactly sure of the multipath performance differences tho. I remember my first reception report from my 10 meter propagation beacon was from (we think) a meteor bounce. I wonder if the 10m propagation beacon network could be taken advantage of for pinpointing these things? Any more news about 2010 NY65? Seems like if there’s embedded precision timing information in the NWS or other beacon transmissions, that could probably be used to discriminate between echos from low-altitude scstterers like airplanes (below 10 km altitude) and the much higher altitude scattering from the meteor trials near 100 km altitude – would there be enough difference in the transit time delay for these sorts of reflection heights for these sorts of SDR rigs to discriminate between the two kinds of scatterers? Discrimination by Doppler shift is a good way to discriminate as already noted – is there a significant Doppler shift present in the meteor trail once the meteor itself has past? To start, you should use a better receiver. RTL-SDR sticks have poor dynamic range (48dB max), so it will get deaf if strong signals are present in band. Agreed. Something like the SDRPlay RSP2 would be perfect. It’s plug-and-play, wide bandwidth, great dynamic range for the price, and it has an API. Take a look at zooniverse citizen science site for Radio Meteor Zoo. 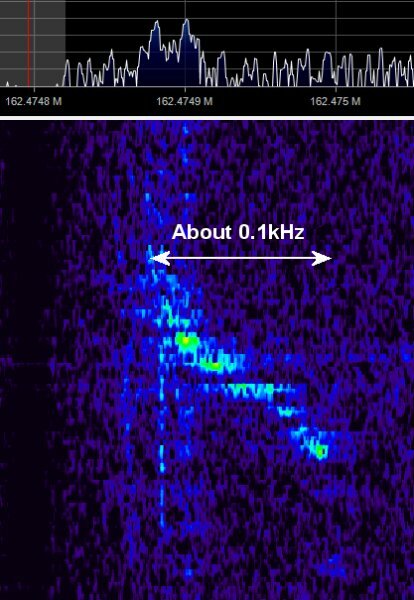 It’s an attempt for volunteers to pick out meteor pings from airplane doppler from a transmit/receive pair specifically designed for meteor cataloging. You can see the difference from an airplane vs the short meteor ping. could also be useful for looking at the finer details such as carrier drift of the RX or TX and more. I think in the US they use ATSC for digital TV. secernment by Doppler fault is a well(p) style to discriminate as already noted – is there a substantial Doppler fault present(a) in the meteor trail once the meteor itself has past(a)? I have a Midland WR120 weather radio. Using this device can a track the meteors.I am eagerly interested to track. Anybody can answer my doubt.